OLIVE GLEN PARK — Pacific Coast Land Design, Inc. The neighborhood Park at Olive Glen is a 2+ acre passive play area built over a capped landfill. It serves the Olive Glen community. The fully accessible park features shaded seating, a play structure and open turf play surrounded by native, low water use planting and permeable paving at the base of the park. An exercise path circles the park. 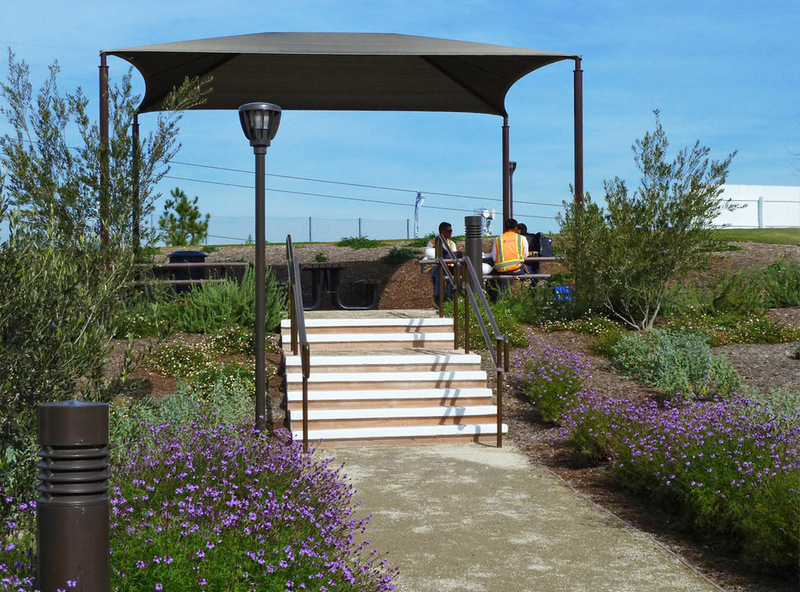 The park was part of landscape architecural services that also included models, street landscaping, common area and front yard planting and irrigation and model homes hardscape and landscape. Low water use native planting and unirrigated native hydroseeded grasses surroung the bermuda grass play area. The exercixe path is permeable class 2 base and the parking area is paved with permeable pavers.